This student submission comes from my former student Brittnee Lein. Her topic, from Precalculus: finding the focus and directrix of a parabola. Parabolas (as we know them) were first written about in Apollonius’s Conics. 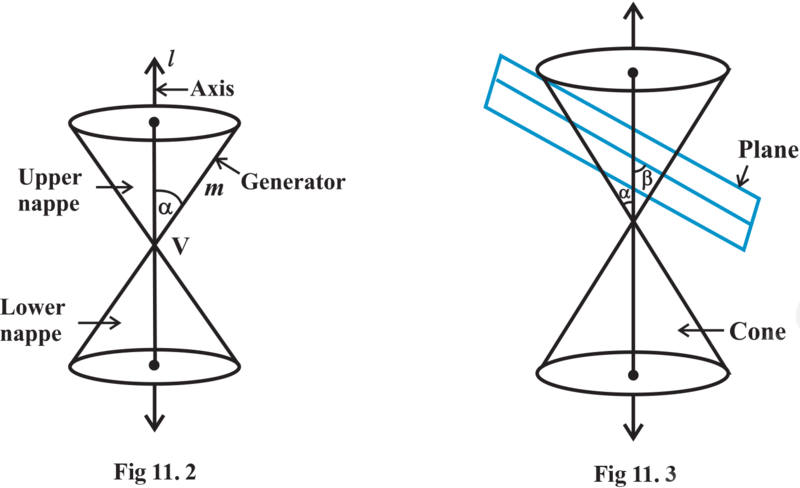 Apollonius stated that parabolas were the result of a plane cutting a double right circular cone at an angle parallel to the vertical angle (α). So, what does that actually mean? Understanding how the focus and directrix affect the equation of a parabola is crucial to understanding what each word means. According to mathwords.com, “For a given point, called the focus, and a given line not through the focus, called the directrix, a parabola is the locus of points such that the distance to the focus equals the distance to the directrix.” The directrix is a line perpendicular to the axis of symmetry and the focus falls on the line of the axis of symmetry. From this, students can shift values of the vertex and see that the directrix stays constant when the x-value is changed and that the focus remains constant when the y-value is shifted. If students change the value of the focus, they can see how it stretches and contracts the width of the parabola and how the directrix shifts. They can also see that when the focus is negative, the parabola opens downward and the directrix is positive. 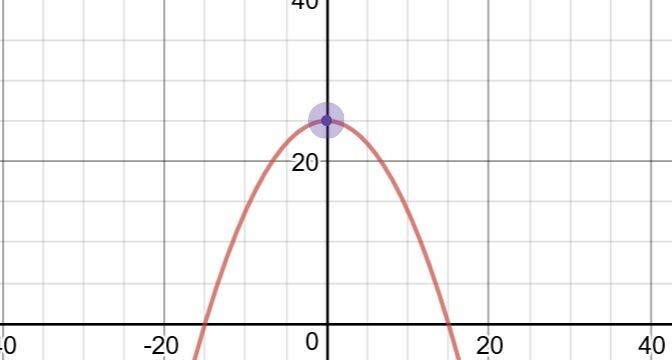 This website: https://www.intmath.com/plane-analytic-geometry/parabola-interactive.php Is also very helpful in showing the relationships between the focus, directrix and the graph of the parabolas because students can clearly see that the distance between a point on the parabola and the focus and the distance between that same point and the directrix are equal. This problem requires a lot of prior knowledge of parabolas and really tests students’ ability to interpret information. 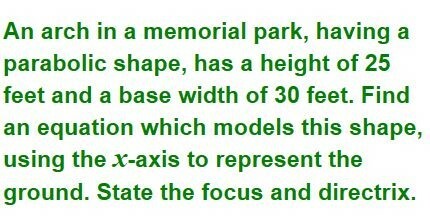 From the question alone, the students can find the x-intercepts (-15,0) and (15,0) from the information “the base has a width of 30 feet”. They are also able to infer that the slope of the parabola will be negative because of the shape of an arch. The student must also know how to find the slope of the parabola using the x-intercepts, solving for the equation of the parabola using the x-intercepts and vertex and the equations for finding the focus and directrix from the given information. There are a few problems as involved as this one on the listed website above. This student submission comes from my former student Caroline Wick. Her topic, from Precalculus: finite geometric series. Finite geometric series was a concept that began over 4500 year ago in ancient Egypt. The Egyptians used this method of finite geometric series mainly to “solve problems dealing with areas of fields and volumes of granaries” but used it for many other uses too, including the pyramids and math problems similar to those one might find on a STAAR test today (see D1, and F1). There are seven houses; in each house, there are 7 cats; each cat kills seven mice; each mouse has eaten 7 grains of barley; each grain would have produced 7 hekat. What is the sum of all the enumerated things? Years passed and finite geometric series were not revisited until around 350 BC by the Greeks, namely Archimedes, who came up with a solution to the math problem V=1/3Ah by finite calculations instead of limits. In addition, the idea that a finite sum could be procured from an infinite series was created in what is called the “Achilles Paradox” (D2, F2). Years after this came Mathematicians in the middle ages, like Richard Swineshead or Nicole Oresme, who aided the world by further refining these series. This eventually led to the renowned Physicist Isaac Newton to “discover the geometric series” after studying mathematician John Wallis’s method of “finding area under a hyperbola” (F1). We can attribute almost all of what we know about geometric series’ to these fine gentlemen above, and they can only attribute what they know from the ancient Egyptians and Greeks. In 2002, PBS came out with a kids’ TV show called CyberChase, which is an entertaining cartoon about a bunch of kids who get pulled into “Cyber Space” to fight the bad guy, named Hacker, all while discovering and using different mathematical concepts that they learned along the way. Eleven seasons have passed since the shows beginning and it is still going strong, but one episode that still sticks out to me was their version of explaining geometric series to kids. The episode was called “Double trouble” and was the 9th episode of the second season. The specific geometric series involved in the episode was doubling, but the “real world” clip at the end stood out more vividly to me. After losing a chess game, the main character has to decide between paying the winner $5.00 or paying one penny for the first space on a chess board, then two pennies on the second, then four on the third, and continuing to double the previous number for every space on the entire chess board. Since the main character thought pennies were less, he decided on the second option, only realize after that he would have to pay way more than $5.00 in the end. This helped me understand the most basic geometric series when I was a kid, and has stuck with me to this day, so I am certain that it has and can stick in other students’ brains as well. How can this topic be used in your students’ future courses in math or science? The idea of finite geometric series is typically lightly introduced around students’ sophomore year of high school when they take geometry, but it is not really expanded upon/explained until students reach Pre-Calculus. The specific TEKS related to this topic are located under Pre-Calculus in (5), (A)-(E) (Source B1). The concept is brought up again in Math Models with Applications and is used for understanding interest on a balance over a period of time, or “loan amortization.” The ideas can also be used to help understand difference equations that involve heat and cooling over a period of time, and how to predict what the temperature might be in the future, which is a concept that is important in the realm of science too. When students get to college, finite geometric series are expanded upon even more when they take Calculus classes, and they will learn how to prove a series is finite using induction when they get to their Discrete Classes and Real Analysis classes. In the business realm, they will have to use it to predict monetary sums regarding interest and possible growth in a company, so likely no matter where a student ends up, s/he will have to use this important mathematical concept everywhere. I believe the best way to get students to start using radians, or know how to convert from degrees to radians. Is giving students a lot of problems where they go back and forth between radians and degrees. It is a fairly simple task but you want all of your students to be able to easily recall how to do this. Another activity could be going over the unit circle with your students. Using the unit circle occurs frequently from pre calculus going forward, just be sure to express that the radian measure is the arc-length divided by the radius of the unit circle to the following point. I also know that my high school teacher always made us fill out the unit circle on every test giving us the degree measurement and making us fill out the radians. This really helped us concrete radian measurements in our head, just for those 5 points it would provide us. I would say after radians and the unit circle is introduced, just about every math class after that has something to do with the two. Even if it is just looking for multiple solutions to a problem, where you just add two radians to the solution you already found. But why do we use radians instead of degrees in high math classes? 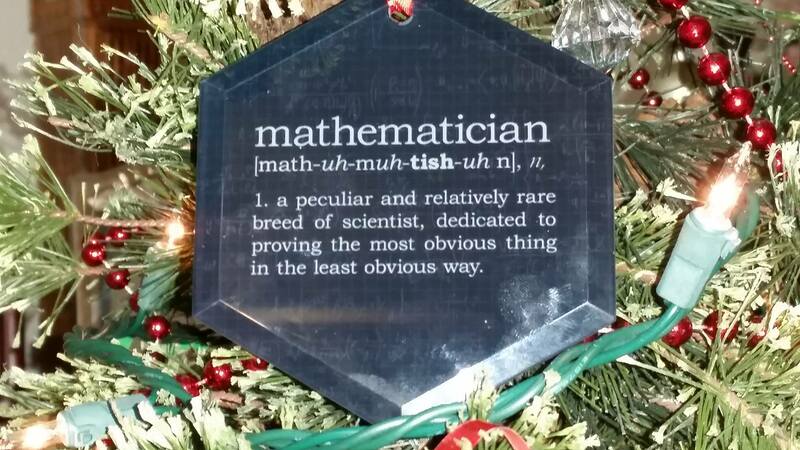 This is because radians are a unitless measurement. Radians are defined as arc-length divided by radius, so the units cancel. This is helpful in higher level math classes because radians are easy to use in derivative and limit formulas. This is the main reason we use radians instead of degrees in higher level classes, the convenience. Desmos.com is yet again another great technological resource to use when introducing radians to the classroom. There is a great activity call “What is a Radian?” That introduces an activity student can do using a plate and folding it into different sections. I actually believe this is how I was introduced to radians in high school. The second part of the activity on desmos after you finish with the plate introduction, is asking students key questions. How many radians are in a certain degree measurements? How many degrees are in a certain radian measurement? As always desmos is still great at introducing radians and lets you easily monitor your students progress. 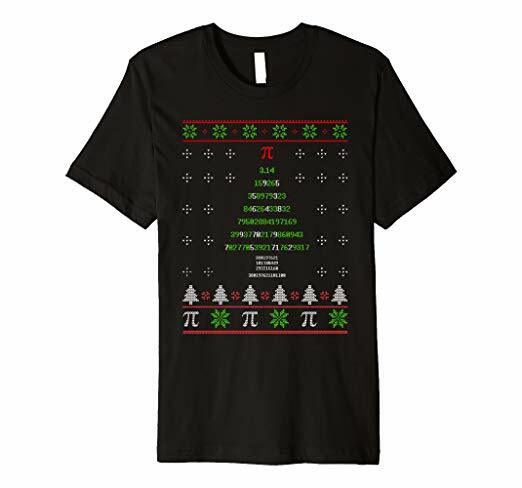 Unlike the shirt in my previous post, this one actually gets the first ten rows of Pascal’s triangle correct. So that’s a good thing. I gave one to my wife and daughter, and it was a big hit. In that moment, I remembered that, a few years ago, she had memorized the first few dozen digits of for her elementary school’s talent show. Somehow, she had retained that bit of trivia all these years later. I didn’t miss the irony: I did not remember that she could remember the first few dozen digits of . As I’ve learned not to daughter my daughter’s memory, I checked two different references (https://www.piday.org/million/ and https://www.wolframalpha.com/input/?i=N%5BPi,1000%5D), and, sure enough, she was right. The shirt correctly wrote the first 47 digits of after the decimal point. But things went haywire after that. 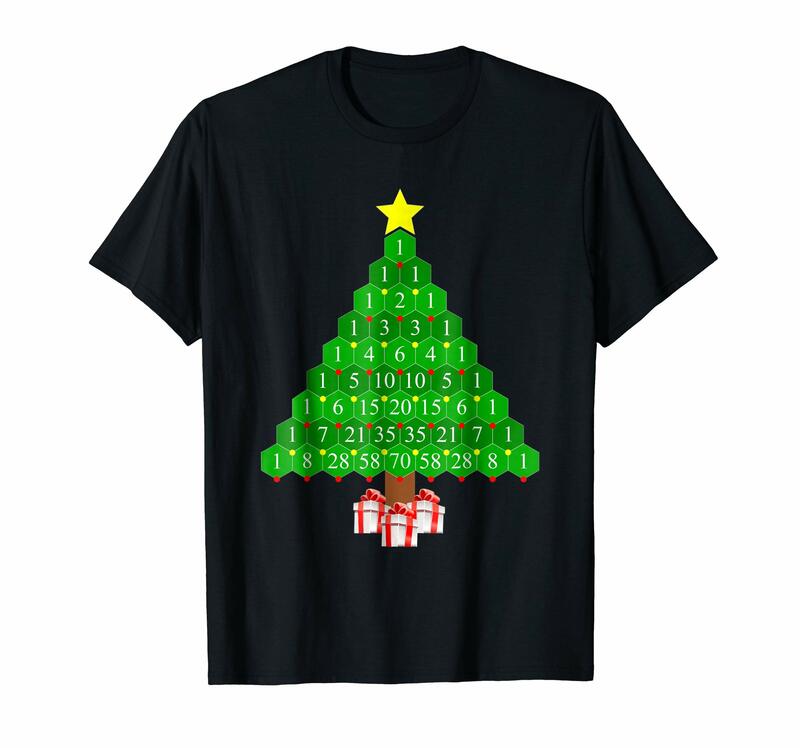 Not only did was the T-shirt’s 48th digit incorrect, but it skipped a few hundred digits in the decimal expansion of before picking it up again! Furthermore, after completing the “tree,” a few thousand more digits were skipped before constructing the base of the tree. And these latter digits were used twice! The first 4,000 digits of are shown below (in blocks of 10 digits). The ones that appear on the T-shirt are marked in boldface and are underlined. I can understand getting a digit or two wrong on the T-shirt, but I have no idea how anybody could have possibly made a mistake like this. Upon discovering this, my first reaction reflected my inner mathematician: “I want a refund.” After all, has been known to 47 decimal places since the 1700s, long before the advent of modern computers. 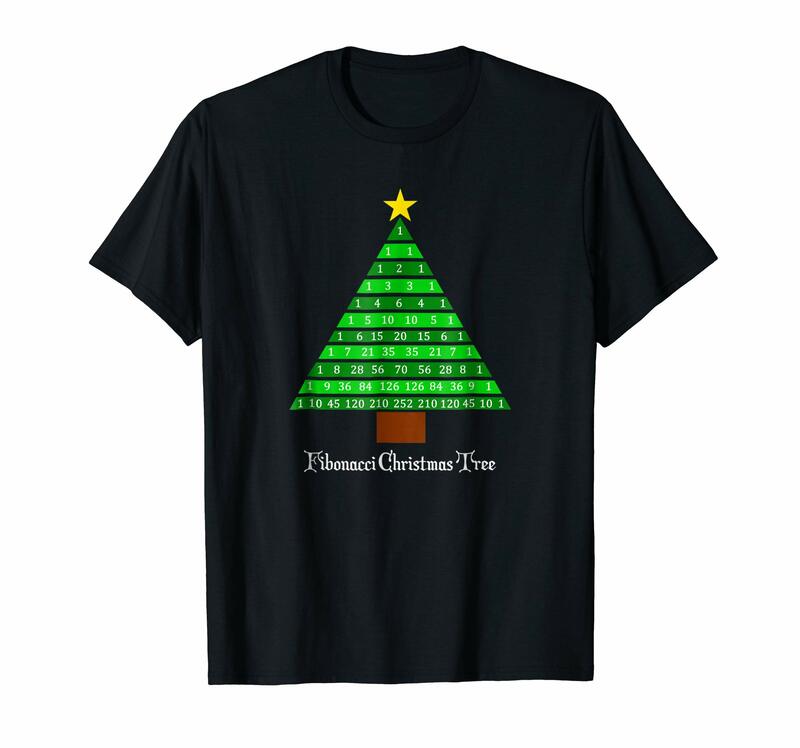 However, upon further reflection, I decided that being able to tell this story of a Christmas T-shirt that incorrectly printed the digits of — and especially the story of how this error was brought to my attention — was by itself well worth the price of the shirt.